The mobile phone owes its existence to the success of the car radio telephone. However, a major limitation on the expansion and further development of this service was the availability of radio spectrum (frequencies). With each frequency supporting only one telephone call at a time there was clearly a need for either massively increasing the number of frequencies available or, developing a more efficient method for using this scarce resource. 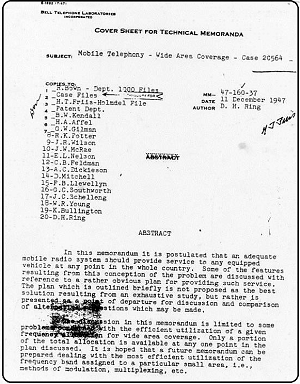 This problem had in fact already been solved by Douglas H Ring back in December 1947 when he published a Bell Laboratories paper entitled “Mobile Telephony – Wide Area Coverage”. Here the concept of a cellular network was proposed in which the country is divided up into small regions called cells, managed by lower power radio base stations. Because both the radio signal range and power are limited, this introduces the possibility of frequency re-use. That is, so long as adjacent cells don’t use the same radio frequencies, then those frequencies can be re-used by other more distant cells. Such a concept did of course mean that as a person moves within the network so their telephone call needs to be passed from one cell to another and with that, the frequency being used also must change. Nevertheless, the concept of frequency re-use overcame the prime radio spectrum limitation of the radio telephone service. Unfortunately, the technology of the day was simply not capable of realising this concept in practice and so it would be many years before the cellular or mobile phone could become a reality. As electronics advanced so cellular moved ever closer and its birth is considered to have taken place on the 3rd April 1973 when Dr Martin Cooper of Motorola was able to demonstrate a prototype handset as he walked along Sixth Avenue, New York, stopped outside the Hilton Hotel and telephoned Joel Engel of Bell Labs. Following on from this, in 1974 the Federal Communications Commission (FCC) in the USA released part of the radio frequency spectrum for use by the first experimental cellular networks. However, these networks didn’t start to appear until 1977 when in Chicago and Newark, AT&T created test networks aimed at mobile car phone users whilst Motorola started a trial in Washington, DC based on their DynaTAC (Dynamic Adaptive Total Area Coverage) handheld mobile phone system and which was operated by American Radio-Telephone Service Inc. The AT&T network comprised ten radio base stations, each of which managed a single cell meaning that the whole network was only ten cells in size. It used the American Advanced Mobile Phone System (AMPS) which had been developed by Bell Labs in the 1960s from their original 1947 proposals. Here, the frequency range of 824-849MHz was used for transmission from the mobile and 869-894MHz was used for transmission from the cell's base station using frequency division multiple access (FDMA) with each voice call being allocated a 30kHz analogue radio channel. Further delays followed before the Federal Communications Commission (FCC) finally approved AT&T’s Chicago trial to become the first commercial mobile network in the USA on 13th October 1983. Earlier on the 21st September 1983, the FCC approved the DynaTAC 8000X phone as the world's first commercial hand-portable mobile phone. Motorola’s Dynamic Adaptive Total Area Coverage (DynaTAC) 8000X cellular handset has become something of an icon, epitomising the 1980s and immortalised by Michael Douglas in the 1987 feature film, “Wall Street”. It was the culmination of 15 years of research by Dr Martin Cooper and Rudy Krolopp and it established the mobile as a genuinely hand-held and portable device. However, it only offered 30 minutes of talk time and 8 hours of standby but perhaps its £2,500 price tag was the more significant limitation for most. This is the design of phone that in the UK would become known as the ‘yuppie’ phone or more generally, as the ‘brick phone’. The delays incurred in the USA gaining formal approval from the FCC meant that they had actually fallen behind other countries in developing mobile services. In Japan, a cellular network based on 13 cells operating in the Tokyo area went live in December 1979. In Europe, mobile phone development was led by the Scandinavian countries, collectively creating the Nordic Mobile Telephony (NMT) network which was launched in Sweden and Norway on 1st October 1981 and Denmark and Finland in 1982. The first NMT network was based on 450 MHz and hence became known as NMT-450. This was followed in 1986 by a second network that used the 890-960 MHz frequency band and became known as NMT-900. The UK Government announced in June 1982 that two licences would be awarded to provide mobile cellular radio networks operating in the 900MHz band. These licences cost £25k each and required that services must commence no later than the 31st March 1985 and provide coverage to 90% of the UK population by 31st December 1989. One of these licences was awarded to BT who, working in partnership with Securicor (Telecom Securicor Cellular Radio Limited), created the mobile operator,Cellnet, whilst the other was offered to open competition. In December 1982 it was confirmed that this second licence had been awarded to Racal Millicom who subsequently, on 22nd March 1984, declared that their service would be known as Vodafone (voice, data, telephone). In February 1983, the Government announced that these two UK mobile cellular networks would be based on a development of the Advanced Mobile Phone Service (AMPS) which would be known as Total Access Communication System (TACS). These first-generation networks were entirely based on non-encrypted analogue transmission that used Frequency Modulation on a 25kHz radio channel using 890-905MHz for transmission from the mobile and 935-950MHz for transmission from the cell’s base station giving it a capacity of 600 channels for the transmission of voice and control signals. Vodafone placed a £30 million order with Ericsson Radio Systems for the supply of the first phase of their network deployment which was to comprise mobile exchanges in London and Birmingham together with 100 radio base stations that collectively offered capacity for 20,000 users. However, when Vodafone was ready to launch their network on 1st January 1985 it comprised only 10 radio based stations providing coverage in London. On New Year’s Eve 1984 with 1985 fast approaching, Michael Harrison left his family’s party in Surrey and drove to Parliament Square in London so that at the stroke of midnight he could telephone his Father, Sir Ernest Harrison. Sir Ernest Harrison was Chairman of Vodafone and when he answered, Michael said, “Hi Dad. It’s Mike. This is the first-ever call made on a UK commercial mobile network“. The UK had quietly entered the mobile era. A more public celebration followed later that same day when comedian Ernie Wise – of Morecambe and Wise fame - arrived at St Katherine’s Dock in London, in a horse drawn Royal Mail Coach, to make a mobile phone call to Vodafone’s headquarters in Newbury. Vodafone initially chose two handset suppliers, Panasonic in Japan who supplied the VM1 car phone and Mobira (later to become Nokia) in Finland who supplied the VT1 transportable. Meanwhile Cellnet chose Motorola as its preferred handset supplier. It was the Panansonic VM1 that Michael Harrison and later, Ernie Wise, used to make their phone calls. 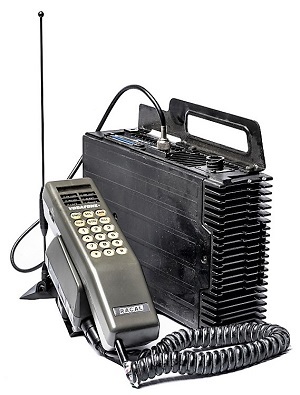 The VM1 comprised a handset and car mounted base unit that collectively weighed 4.9kg and retailed for £1,475. 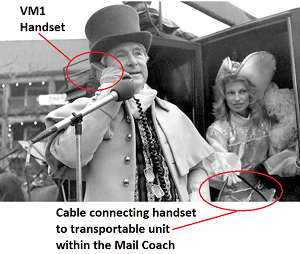 In the pictures of Ernie Wise making his famous call, you can tell that he is holding the VM1 handset but the base unit is located within the Royal Mail Coach with the wire connecting the two being clearly visible. Ernie Wise making the first public phonecall on the Vodafone network on 1st January 1985. Evidence of the VM1 Transportable being used is highlighted. Seven days later, on the 7th January 1985, Vodafone was joined by Cellnet, who opened the UK’s second mobile network which comprised 15 radio base stations serving London. Vodafone quickly expanded their network to cover the M1, M4 and M5 motorways along with the centre of Birmingham by September 1985 and similarly, Cellnet extended their coverage into Birmingham, Manchester and Liverpool. The architecture of a first generation TACS cellular mobile network comprised a Base Transceiver Station (BTS) located within each cell to manage the radio interface. The BTS is the visible part of the network in the sense of it being the radio tower you see on roofs and by the side of roads. Each BTS is then connected via landline or a point to point microwave link to a Base Station Controller (BSC); with each BSC connecting several BTSs. The BSC is responsible for radio network management of each BTS that it manages and call handover between them. Each BSC is then connected to a Mobile Switching Centre, for which there could be more than one, and which acts as the core circuit-switched exchange of the network handling authentication, call setup and termination, billing, and mobile phone location tracking. The MSC also provides connectivity to the conventional packet switched telephone network (PSTN). The governments of Europe agreed that 10MHz of bandwidth would be reserved for the next generation of pan-European mobile phone services. Within the UK this equated to the upper 10MHz of the TACs bands and so these frequencies would never be made available for analogue networks. However, as mobile phone usage grew, especially in London, network operators started to run out of capacity. Therefore additional frequencies were released at the lower end of the existing TACs band. These frequencies had previously been allocated for military applications and were released to the mobile phone operators in August 1986. Consequently, the addition of these extra frequencies extended TACs into ETACS which now used 872-905MHz for transmission from the mobile and 917-950MHz for transmission from the cell's base station thereby increasing capacity to 1320 x 25 kHz channels. When the UK’s first mobile networks were launched in 1985, there were broadly three types of handset available. The Car Phone was, like its radiophone predecessor, intended for installation and use only within a vehicle and comprised a handset mounted on the dashboard with all of the radio circuitry installed within the boot and an antenna on the roof. A Transportable mobile was similar to the car phone, in that it was intended for use within vehicles but it was also designed with a detachable battery pack so that the mobile could be taken and used outside of the vehicle. Finally, the Handportable was physically the smallest mobile device being totally portable and intended to be carried at all times by its user; it is this one that has become the ubiquitous mobile phone of today. Nigel Linge demonstrating that a Technophone handportable really did fit inside a shirt pocket! In the mid to late 1980s, both Vodafone and Cellnet focused on the corporate or small business user who would naturally opt for either a car phone or transportable. For someone involved with sales, owning a mobile ensured that they were always in contact and no longer had to spend a day in the office catching up with phone calls and making appointments. Most of these users favoured the transportable for they were typically travelling by car. However, it was the handportable that would allow the mobile to be marketed to the general consumer but in 1987 only 15% of Vodafone’s subscribers were using handportables. Motorola, with their strong history in radio telecommunications, was especially influential in the early days of the mobile phone. Following on from their DynaTAC 8000X came the world's first flip phone, the Motorola MicroTAC which further revolutionised and miniaturised the mobile phone. Competition from Europe came in the form of UK based Technophone and Nokia-Mobira Oy in Finland. Technophone was set up by Nils Martensson in 1984, a Swedish engineer who had previously worked for Ericsson. His goal was to transform the mobile phone from a large, cumbersome brick into a portable, small and usable device. Technophone sold their mobile phones through Excell Communications branded as the Excell M1 and M2 or PC105T. The Pocketphone PC105T was released in 1986 and retailed at £1,990 but as the adverts showed, it did indeed fit inside a standard sized shirt pocket! This device had a major influence on the future of mobile phone design and Technophone were soon selling 1,000 Pocketphones per month. Nokia-Mobira Oy had been established in 1984 to produce transportables for the Nordic Mobile Telephony (NMT) network. However, the Nokia-Mobira Cityman 1320 was their first truly hand held mobile and was released in 1987 for the UK TACS network. Having become Europe’s second largest mobile phone manufacturer by volume behind Nokia in 1991, Technophone was sold to Nokia for £34 million which in turn propelled Nokia to become the world’s second largest mobile manufacturer behind Motorola. In 1992 Nokia released the first of their candy bar phones, the Nokia 101 which was promoted as the world's most portable phone. In the Far East, manufacturers such as Sony developed the CM-H333 in 1992 which became one of the most desirable handsets of its time and was responsible for extending the useful life of the first generation analogue networks by a few years. It became known as the ‘Mars Bar’ phone because of its rather chunky design. A condition of the mobile licences issued to Vodafone and Cellnet was that neither company was allowed to sell directly to customers. Instead, their services had to be offered via retailers or service providers who in turn became responsible for customer contracts, billing and setting of tariffs. One such company was Peoples Phone which was formed in 1988 and became the UK’s largest independent mobile service provider. This restriction was eventually lifted and on 19th November 1996 Vodafone bought Peoples Phone for £77m. Motorola StarTAC 3000 - the smallest TACS handset and the world’s first clam-shell mobile phone. Advances in miniaturisation reached new heights when on 3rd March 1996, Motorola launched the StarTAC 3000. This was not only the world’s first clam shell phone but also at the time the lightest and smallest mobile ever produced. Weighing only 105g, the StarTAC folded completely in half when not being used. Marketed as a ready to wear accessory but costing around £1,500 to purchase, this marvel of electronics design cost more than its equivalent weight in gold. Whilst still only a basic featured phone, over 60 million were sold over the product’s lifetime and in 2005 PC World magazine rated it at number 6 in a list of the 50 Greatest Gadgets of the Past 50 Years. At the start of the mobile revolution a typical transportable weighed 4.5kg and required a carrying handle; by 1995 handportables were dominant where mobiles weighed 250g and could fit inside a shirt pocket. Owning a mobile phone remained expensive which meant that companies still focused on selling to the business community. Even by the mid 1990s prices remained high. Connecting to the BT Cellnet network required you to pay a one-off connection charge of £50, a monthly contract fee of £55 with calls charged at 23p per minute during the peak times of Monday-Saturday 09:00 to 22:00 or 12p per minute at all other times. No wonder that call timers became a standard feature of mobile phones! By the end of 1986 there were 100,000 mobile phone subscribers within the UK which doubled to 200,000 by the summer of 1987 and by the end of 1995, 7% of the UK population owned a mobile phone. After ten years of service, the mobile phone had started to become accepted as a normal part of society. Despite all of the advances made in terms of weight, miniaturisation and battery life, a mobile phone in 1995 was designed to provide the same basic function as the first models that had been released in 1985, namely to make and receive telephone calls. An ETACS mobile network was designed to serve one purpose and that was to manage and handle these analogue voice calls; there being no inherent provision for a data service. Anyone wanting to send data over an ETACS network had to use an external modem in the same way that users could connect to the Internet from home using a telephone dial-up service. There was however, a major problem with these first generation UK mobile phones and that was that they stopped working at the English Channel. The Nordic Mobile Telephone (NMT) system in Denmark, Sweden, Norway and the Netherlands, the C-Netz (Funktelefonnetz-C) system in Germany, the Radiocom 2000 service in France and RTMI (Radio Telefono Mobile Integrato) in Italy were all totally incompatible with each other and ETACS. The only other European country to adopt TACS was Ireland where their analogue cellular network was operated by Eircell, a company established by Telecom Éireann. But three years before the UK launched its first analogue networks, the European Commission started a programme of work that sought to develop a mobile phone standard that could harmonize public mobile communication systems throughout Europe. That work lead to the development of the second generation (2G) of mobile phones which were based on a digital technology, known as GSM, and which replaced the analogue ETACS networks. BT Cellnet closed their ETACS network on 1st October 2000, Eircell in Ireland closed theirs on 26th January 2001 and Vodafone closed theirs on 31st May 2001 thus bringing to an end the 16-year era of TACS analogue mobile phones. You can read more about mobile phones in the articles which we have made available within the PUBLICATIONS section of this website or in our book: “Thirty Years of Mobile Phones in the UK” which explores the origins of the mobile phone in the UK and its evolution over the thirty year period from 1985 to 2015. Explore our collection of TACS mobile handsets which is arranged here by the year in which each model was released. Further details about each mobile can be seen by clicking the make and model number. Alternatively, you can click one of these links to view the complete collection in full detail ordered either by the year in which each mobile was released or by the mobile manufacturer. This website does not use any cookies of its own but it does use third party cookies arising from the use of embedded YouTube videos and links to Twitter. The purpose of those cookies is to enhance your browising experience. However, the operation of such cookies is outside of the control of this website. By clicking ACCEPT you are agreeing to continue to use this website and allowing it to use the aforementioned cookies.